Home › wood fired pizza › Open For Business! Well, what has always been a dream is now a reality! We were cleared to open back in mid-November but took our time getting the word out. There are so many facets when opening a new restaurant – especially in a remote location like Estes Park, CO – that one must really get their proverbial ducks in order before setting out the shingle. 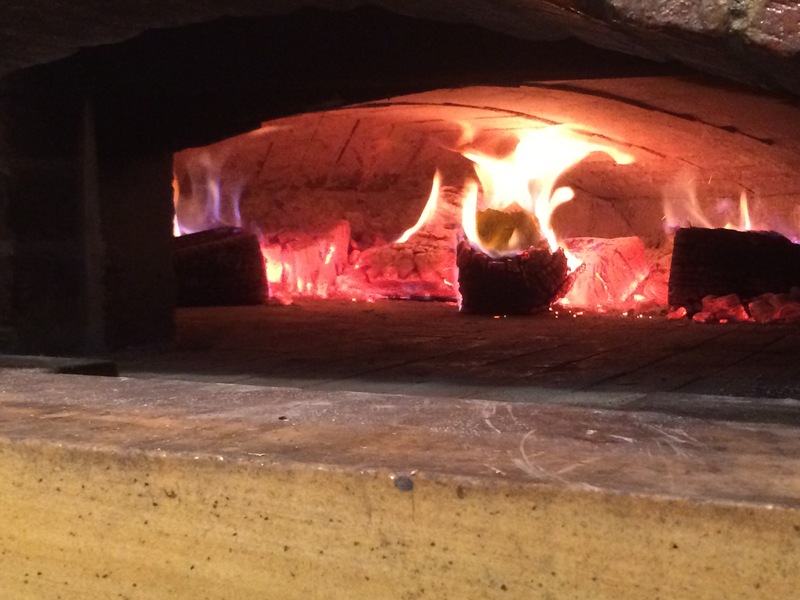 Through word of mouth and some select Facebook ads, we managed to get in enough folks to test the processes, refine what we thought were good ways to go about certain tasks and above all, learn how a wood burning, brick oven of this magnitude operates. That has been the most fun of the initial month open. The beautiful fire you see above is very finicky. Just when you believe you understand it, there was something you didn’t know and of course it bites you. In a traditional oven, you have plenty of time before things burn. In this oven, I could burn your pizza in 20 seconds or less. No exaggeration at all. We’ve had a pizza out of here in two minutes and change. That’s an awful lot of cooking in a short time and you best believe it will make a fool of you quickly. Enough of the technical aspects, onto the food. We started with big ideas of many products and quickly learned that pizza in several varieties- Sicilian, NY Round and Margherita was more than enough to start with.